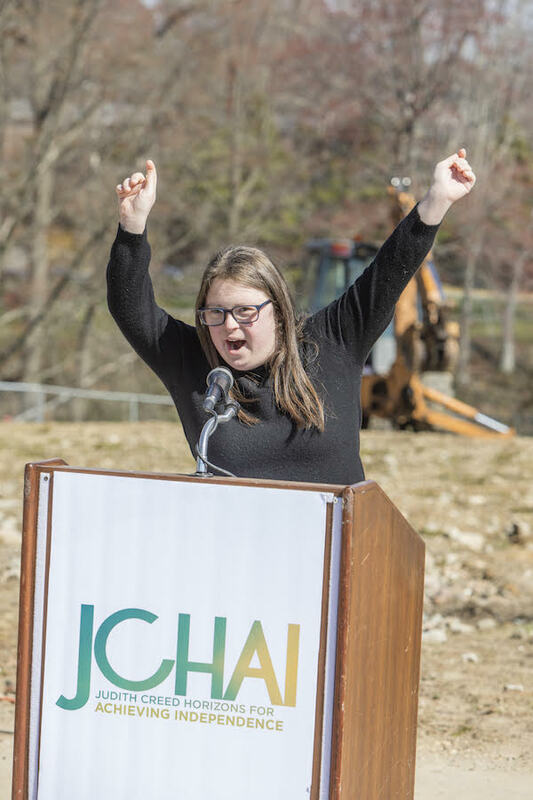 Bryn Mawr, PA, April 18, 2018 –Judith Creed Horizons for Achieving Independence (JCHAI), an organization empowering adults with developmental disabilities and autism to live and work independently, broke ground today on its new Education Center. The John and Jacqueline E. Swartz Education Center, located on the Jewish Federation’s Schwartz campus, will provide an inclusive environment where JCHAI members and non-members can secure the skills needed to live and work independently. The new John and Jacqueline E. Swartz Education Center will house JCHAI’s Transitions program as well as other programming, where through training and education, JCHAI provides its members with the skills needed to live and work independently in the larger community. JCHAI’s Transitions program targets young adults with developmental disabilities or autism while they are in high school and before they age out of school programming. This early learning approach to independent living outside of the school system is unique to JCHAI. In this center, JCHAI members will receive educational, social and vocational training, which will open the door to the notion that independent living is within reach, while allowing parents to envision a more fruitful life for their children. The new Education Center will include several classroom spaces with smartboards, a teaching kitchen with range, dishwasher, sink and island, and a dining area off to the side of the kitchen where participants can learn social skills like setting a table and hosting a dinner party. The building will undergo construction over the next nine months. Along with educational and social programming spaces, the new building will also include the “HUB” – a JCHAI participant-run coffee shop where members can learn how to independently conduct business by selling coffee and pastries to those utilizing the campus throughout the day. The Education Center is expected to open in early 2019. For more information on JCHAI and its services, please visit www. jchai.org. Founded in 1987, Judith Creed Horizons for Achieving Independence (JCHAI) empowers adults with developmental disabilities or autism to live and work independently. Through educational, vocational, social and residential services, JCHAI’s experienced staff help create an inclusive environment where adults with disabilities can learn, have fun and live up to their potential. To learn more about JCHAI’s programs and offerings, please visit www.jchai.org or check us out on social on Facebook or Twitter.